In 1871, the U.S. government issued a new series of documentary revenue stamps to replace the 1862 “first issue” stamps. Counterfeiting and chemical removal of cancellations from the first issue stamps prompted this decision. 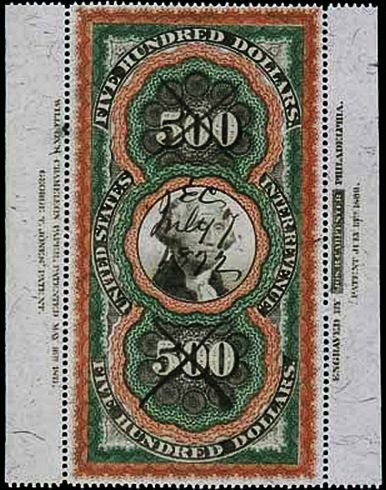 Unlike the first issue stamps, the second issue varieties were printed in at least 2 colors, with the $200 and $500 varieties printed in three colors as an additional security measure. 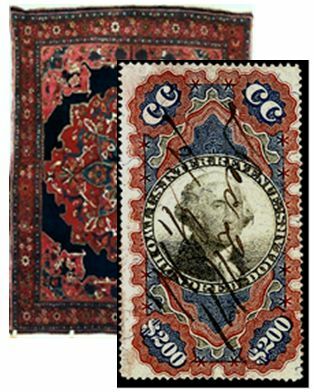 Given the three colors, elaborate designs and ornate scrollwork on these two stamps, they are often referred to as the small and large “Persian rug” revenue stamps. 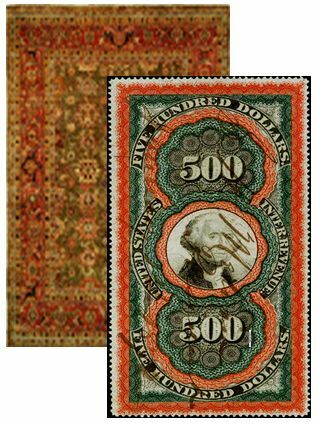 The $500 stamp especially resembles a hand-woven rug as seen with the two stamps superimposed on images of Persian rugs, Figures 1 and 2. The $200 small Persian Rug had a printing of 446 copies, with approximately 125 surviving examples. The stamps were printed one to a sheet, with margins on all four sides. 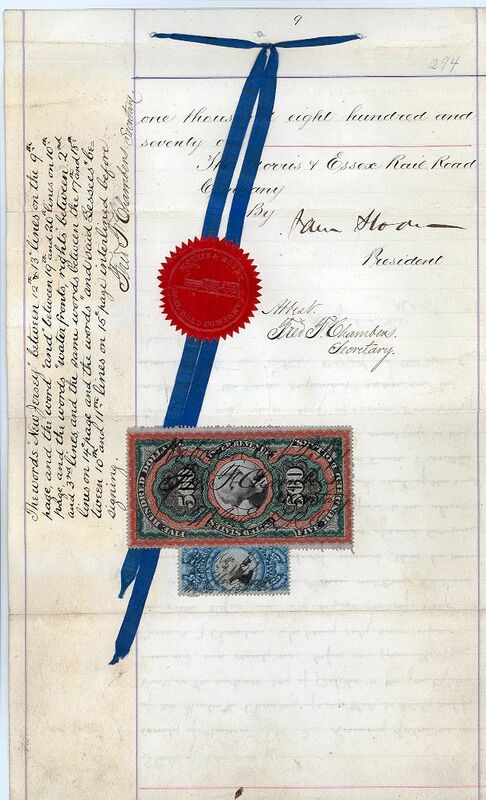 The only surviving full sheet of the small Persian Rug, Figure 3, was used to pay the tax on the 1872 will of Erastus Corning, Sr. (of Corning Glass Works). Some revenue specialists have reported a second existing copy of the $200 issue with only partial margins intact. Only four $200 small Persian Rugs surviving on documents have been recorded. Arguably the most intriguing of this group is the usage on a two-part deed, with part one shown in Figure 4. 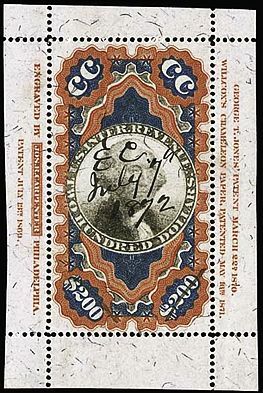 Along with three $50 revenues (R131) and a single $10 revenue (R128), the exceptionally well-centered small Persian Rug is highlighted as the key stamp on this document which sold at auction for $11,500. The $500 large Persian Rug is truly a “large” stamp measuring 2 1/8 by 4 inches. 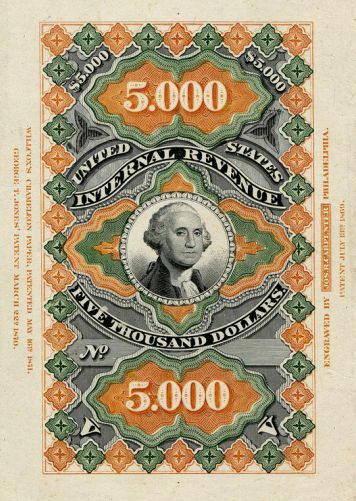 It is considered the most beautiful of all US revenue stamps, and some will contend it even deserves the lofty ranking of the most striking issue in all of U.S. postal history. 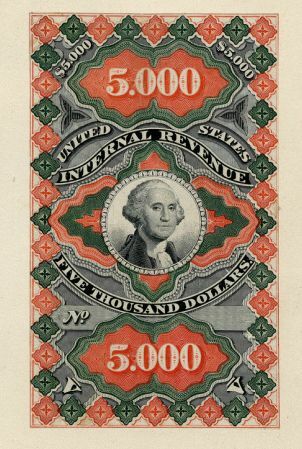 Joseph Carpenter’s company, the holder of the printing contract for the Persian Rug stamps, provided the government with several equally stunning designs for a $5,000 stamp as trial color essays, seen in Figure 5. These were never printed and, thus, never rivaled the beauty of the large Persian Rug stamp. Only 204 of the $500 variety were sold and a mere 67 surviving copies have been recorded. 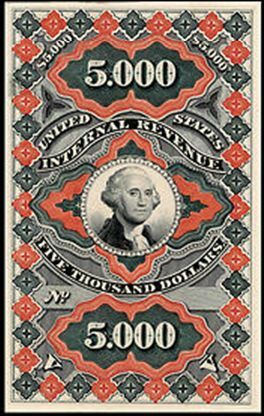 The reason for the small quantity is the simple fact that in the 1870s a $500 revenue stamp would be needed to pay the tax on a $5,000,000 transaction, an enormous sum of money at that time. Persian Rug on an original document. of the Morris and Essex Rail Road Co. is a single $500 issue accompanied by a less significant 25-cent second issue revenue (R112C). But the entire four-page document bore ten of the large Persian rug stamps: three pages had three stamps each, and the final page with the single stamp. 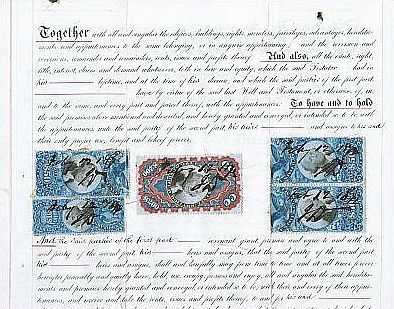 With a $1,250 Scott catalog value at the time of the auction, the nine stamps that had been removed from the document and the tenth example remaining on the final page, brought bids totaling $5,275. But bids for the combined lots were less and, consequently, the stamps were sold individually. Recent auction sales of the $500 large Persian Rug have realized prices from $10,000 to $14,500. The stamp typically has a few faults so, of course, the higher sale amounts were for copies that were well-centered with rich colors, sharp impressions and had only minor faults. The "Persian Rugs" are truly extraordinary stamps and have a well-deserved reputation as unparalled classics of revenue philately. For additional insight into U.S. revenue stamps, see Castenholz, Bill J., An Introduction to Revenue Stamps, Castenholz and Sons, 1994. The premier organization for collectors of US revenue stamps is the American Revenue Association. The ARA publishes a bimontly magazine, The American Revenuer. Membership information can be obtained from Eric Jackson at eric@revenuer.com or on his website, www.ericjackson.com.